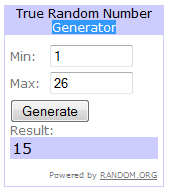 According to random.org, commenter #15 was selected as the winner of the This Charming Candy giveaway. Congratulations Jenna. I’ll be emailing you with more details. Thanks to everyone who entered. I’ve got another give away coming up before the end of the year…stay tuned. On this day before Thanksgiving the Internets are sure to be chock full of swoon worthy recipes perfect for your Turkey Day table. 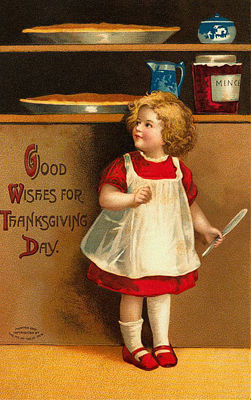 For those of us who choose to give thanks with something other than Meleagris gallopavo, here are a few UnTurkey ideas. Is pork more your flavor? Then perhaps you should invite David Lebovitz’s Carnitas to dinner. Looking for a vegetarian option? How about a nice big bowl of Lentil Soup with Vegetables from Delicieux? Metric conversions aside, this is a quick and easy soup you will be thankful for. And if you want to jazz up some sweet potatoes, how about a Warm Lentil and Sweet Potato Salad with Maple Vinaigrette from The Washington Post? Happy Thanksgiving y’all. May your table, and your day, be full. I am a planner. Perhaps I’ve mentioned that before? I like to know where I’m going and how I’m getting there before I embark on a journey…whether it be out in the world or in my kitchen. So I hate it when I have a plan all nicely laid out and someone comes along and tells me that I should do something different. Change, especially last minute change, and I don’t see eye to eye. So it is grudgingly that I let it into my world. Now that we’ve established that I’m the kind of person that would rather eat glass than do something like change my menu at the last minute, I’m going to put on my hypocrite hat and say that while I’m sure you have a lovely dessert planned for Thanksgiving this week, you need to forget about that. Because you absolutely need to make this pumpkin tart. I know that might sound like nails on a chalkboard to you (it would to me), but I would not suggest such a thing if it weren’t imperative that you become acquainted with this tart. 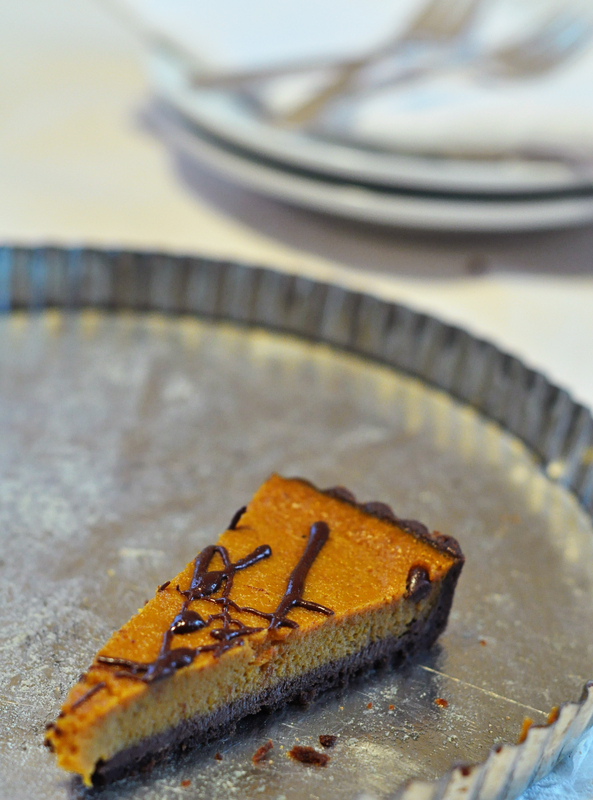 I’m not going to pretend that this tart is any less of a calorie bomb than its cousin, pumpkin pie. It’s got butter, sugar, chocolate, creme fraiche, and egg; there’s nothing light about it. The chocolate spice crust is a perfect complement to the custard filling that is silky and rich but avoids being heavy or overly sweet. So why should you make a change this late in the game? Because in addition to being a welcome change from pumpkin pie and being an outstanding dessert on its own merits, pumpkin tart is unexpected. You can get a pumpkin pie anywhere. Walk into any grocery store or kwikimart and you’ll be bombarded with mass produced, industrial, pumpkin pies for sale. As tasty as they are, they’re a dime a dozen. While not any more complicated than a pumpkin pie, pumpkin tart just looks fancy. And that little bit of fancy makes you feel special. So this Thanksgiving, go for special. Curse me all you want now as long as you are prepared to take every word back when you experience pumpkin tart. BAH Note: I have Sweet Mary to thank for introducing me to Pumpkin Tart. She brought it to our Inspired Supper and I was so impressed by the tart that I finally pulled out the tart pan that has been sitting in the cabinet for over a year and made it myself. Despite having the dough as cold as possible, I still found that it warmed up quickly resulting in sticking and tearing. If that happens, put the dough back in the fridge for ten or fifteen minutes to firm back up before continuing. A big hunk of dough ripped off as I was placing it in the pan so I just used my fingers to work the pieces back together. After it’s filled, you can’t tell whether you rolled your dough perfectly or whether it fought you like a rebellious teenager. So don’t sweat it. Whisk together the flour, sugar, cocoa, salt, and spices in the work bowl of your mixer. Using a box grater, quickly grate the butter into the flour mixture. Using your hands, gently fold the butter into the flour mixture. Place the bowl, along with the paddle attachment from your mixer, into the refrigerator (or freezer if you have the room) for 20 to 30 minutes. 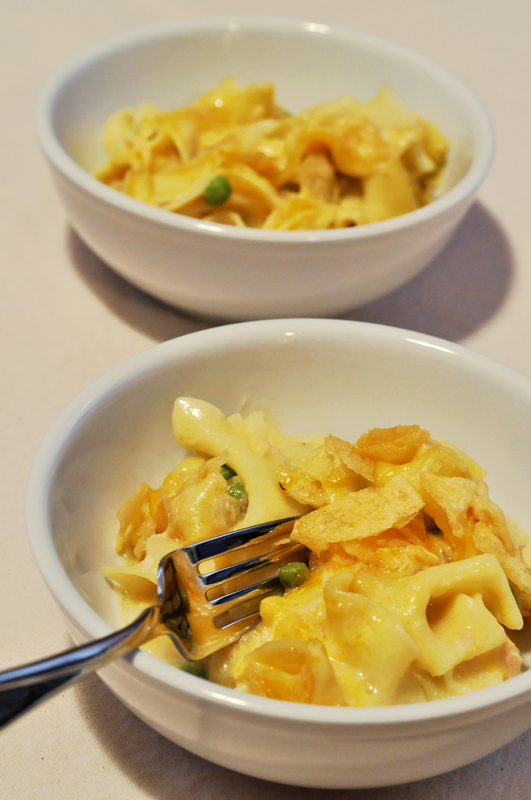 Then mix on low for a few minutes until the mixtures resembles coarse meal and the butter is pea-sized. Add the egg and mix until everything just comes together to form a dough. Shape the into a disk, cover it in plastic wrap, and refrigerate for at least an hour, and up to a day, before proceeding. Preheat the oven to 350 degrees. Roll the dough out to 1/8 inch thick on a lightly floured surface. Brush off the excess flour. Transfer the dough to your 10-inch tart pan with a removable bottom. Press the dough into the bottom and up the sides of the pan and trim the edges. Use a fork to lightly prick all over the bottom of the dough. Chill for 30 minutes. Bake the shell until it is firm, about 15 minutes. Immediately sprinkle the bottom of the shell with the chopped chocolate and smooth with a spatula. In a medium bowl, whisk together the pumpkin, brown sugar, creme fraiche, and spices. Taste for seasoning and add more spice as desired. Add the eggs and whisk until smooth. Pass the mix through a fine sieve set over a clean bowl, discarding any solids. Pour the filing into the prepared chocolate crust. Bake at 350 degrees for about 40 minutes or until the filling is set. Transfer to a wire rack and cool for 30 minutes. Melt the chocolate in the microwave in 30 second intervals until melted. Use a fork or piping bag with a very narrow tip to drizzle the chocolate over the tart forming decorative stripes. Chill for at least an hour before serving. When was the last time you had a lollipop? Think about it. When you’re a kid, people hand you lollipops left and right. You get them at the bank and the doctor’s office. I even ran across something online recently where a dentist was giving out lollies to the kids. I guess that’s one way to ensure job security. But after you’re no longer cute by virtue of being young and precocious, the supply of lollies coming your way dries up. My last real encounter with lollipops was in high school when the cheerleaders struck upon the idea of selling blowpops for a fundraiser. It was genius really. Those girls walked the halls with the bulk boxes of blowpops and we all flocked to them for the chance to exchange two quarters for a chunk of gum wrapped in a lollie shell. I think they had the entire student body of Elkton High School hooked on their sugary stash. But after that, lollipops and I pretty much went our separate ways. I would occasionally score a DumDum on my way out of the vet but they were never as good as I remembered them being from my days as a young, precocious thing. And then this summer the Universe took me to Seattle, home of This Charming Candy, and I rediscovered the joy of lollipops. I am all for doing what you love. I’m also all for things that taste good. 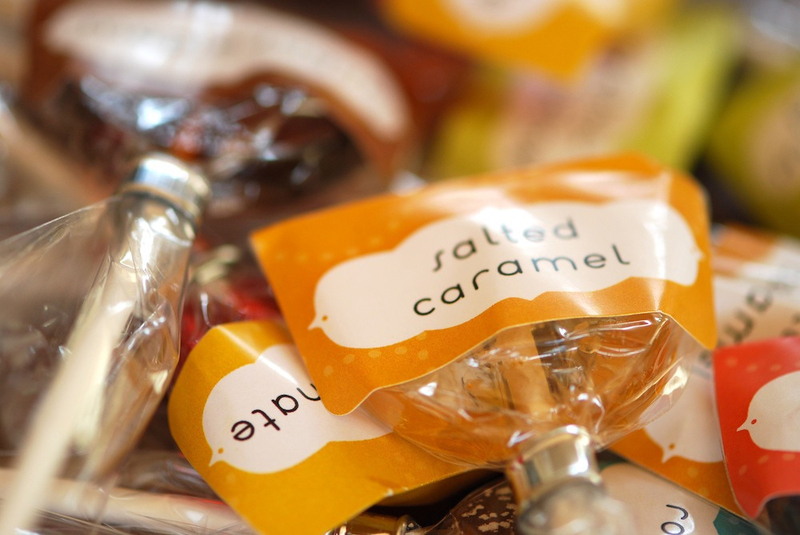 So having been tipped off about This Charming Candy before my trip to Seattle, I pestered Susan via email into meeting me and selling me some of her Salted Caramel lollie love. She could not have been more gracious or generous with her time during my visit. And let me tell you, she totally delivered a sophisticated, adult lollipop that made me sing with delight. The future may look back and dub Salted Caramel the sundried tomato of 2010 but I insist that it is timeless perfection. Imagine salty and sweet happiness on a stick. Despite such intriguing flavors as Birthday Cake, Teaberry, Nutmeg Creme, Maple Sugar, Blueberry Muffin, and a Twilight themed collection of Blood Sucker, Sweetheart, and Lickanthrope, I am steadfastly loyal to the Salted Caramel. As we move into the gift giving season, I know some people for whom artisan lollipops would make the perfect holiday gift. Maybe you do too? And I imagine Santa wouldn’t mind finding a lollipop instead of cookies at your house as he burns the midnight oil on Christmas Eve. Or maybe you want to treat yourself to a small indulgence. Whatever the reason, This Charming Candy makes it easy for you to rediscover the love of lollipops. I love the lollies that This Charming Candy produces and I believe in supporting people taking a chance on doing what they love, so I’m giving one Bon Appetit Hon reader the chance to discover This Charming Candy for free. No strings attached. All you have to do is check out This Charming Candy’s blog or Etsy shop for all the fantastic flavors Susan and Kate are offering up and leave me a comment saying which flavor you find most interesting. Leave me a separate comment saying where you posted for each additional entry (one entry each for Twitter and Facebook for a maximum of two additional entries). All comments must be received by midnight on Thursday, November 26th and the giveaway is open to residents of the US and Canada only. The commenter randomly selected as the winner will receive $20 worth of shopping plus shipping in This Charming Candy’s Etsy shop. You will be contacted by email if you are the winner so be sure to include your email address in the comment form (will not be published with your comments). This Charming Candy is a licensed food handler and processor in the state of Washington, and they make their candy in a licensed commercial catering kitchen. This kitchen processes foods to which some customers may be allergic, including milk, eggs, fish, crustacean shellfish, tree nuts, wheat, peanuts and soybeans. This giveaway is being sponsored by me personally. I have not received anything in consideration for this post. I just wanted to thank you with some lollie love for following my adventures here at BAH.